With only two shades of yellow and a touch of green, Guiragossian manages to produce this masterpiece of simple beauty and geometric significance. The composition is set in two decentralized squares or color zones, organized according to a precise geometric system. The coloration of the zones suggests that they are in front of or behind one another (whereby changes in the light condition can intensify or even reverse the spatial organization.) In contrast to hard edge painting, the zones of color meet without any linear demarcation; the borders of color and form are identical – a further characteristic of Guiragossian’s extreme economy of approach. Moreover, the upper and left narrow color strips seem to be more active than the lower broad one, creating the illusion of steps. 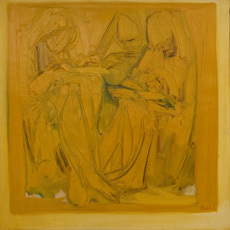 As for the subject matter, the artist has carefully carved into the saturated yellow square three divine women with their books, accentuated by strokes of green for depth. One may easily find Malevitch’s suprematist influence in the geometrical aspect of this painting, and the prominent influence of Josef Albers ‘Homage to the Square’ with regard to the yellow zones, which perhaps Guiragossian meant to discreetly convey.